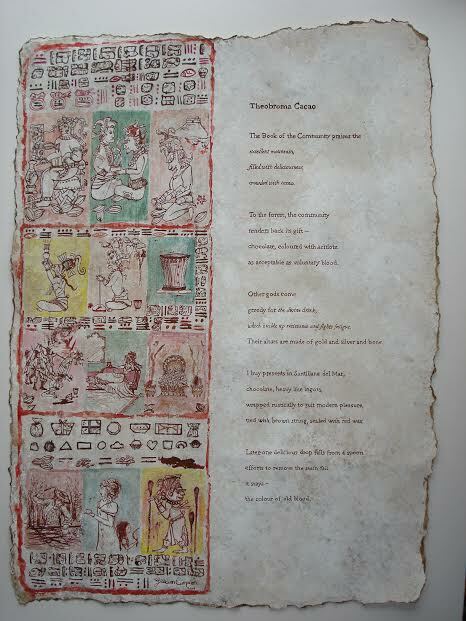 worked the images from Mayan texts. as acceptable as voluntary blood. which builds up resistance and fights fatigue. Their altars are made of gold and silver and bone. tied with brown string, sealed with red wax. the colour of old blood. Theobroma Cacao* is a reflection on the history that lies behind our chocolate confections of the 21st century. This history shows chocolate was a delicious and valuable food as early as two thousand years ago. It was a sacred and communal drink among the Mayan people who first discovered the cacao tree in the tropical rain forests of Central America. Later, its value was recognised by their Aztec rulers and then by the Spanish colonists who brought chocolate as a luxury item to Europe. Its history is shadowed by the destruction of the Mayan civilisation and the decimation of its people. I was struck by how the story of chocolate raises issues for us today in how we source and use food. * Theobroma Cacao is the formal botanical name given to the cacao plant by Carl Linnaeus, the great 18th century botanist. Theobroma is from two Greek words meaning ‘Food of the Gods’. This entry was posted on 12 July, 2017 in homepage and tagged Carmel Cummins. Bookmark the permalink.